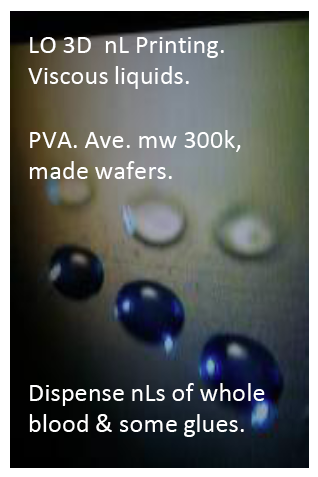 Induction Based Fluidics from nanoLiter LLC. Patented nL Programmable Wave. Program droplet energy, wave, polarity, locale & timing. 100% input efficient, UPLC ESI MS, ms. Infusion or MALDI (LC) via the SAME Android or analogue tool. Same Device Yields Fastest (ms) ESI Infusion on the planet & MALDI prep as well. Positive ion profiles generated by individual drops a. Total ion current. b. [M(NO3)2(CMPO)]+. c. [M(NO3)(CMPO)2]2+. Blue = Ce3+, Green = Tb3+, Red = Lu3+. Varied droplet programming. See AC, June 2013. Dr. G. Groenewold, et al [*]. 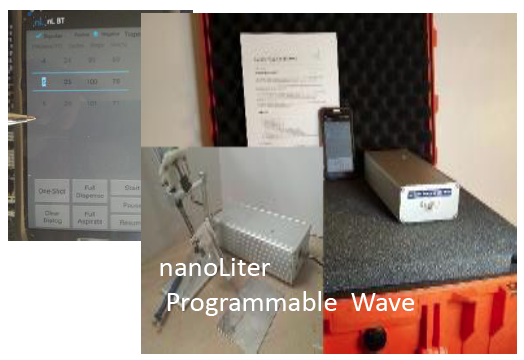 ESI UPLC MS, 100% input efficient via Android controlled nL Programmable Wave. Extracted ion chromatograms of nucleosides cytidine, uridine, 5 methyluridine, adenosine, and 2’-O-methyladenosine separated on a PGC capillary column and introduced into the masss pectrometer by inductive charging. 40 min run. Asilomar2016. 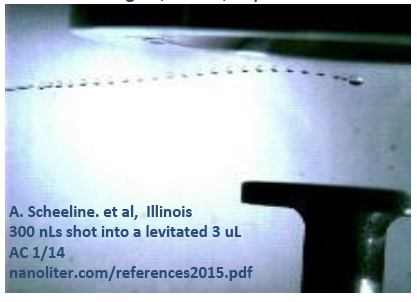 Also see JMS Oct. 2015, Drs. Ross & Limbach [*], U of Cincinnati. Excellent R&D Tool. Great DOD Apps. Safely handle toxics. Intelligent, GREEN, No/Low waste! 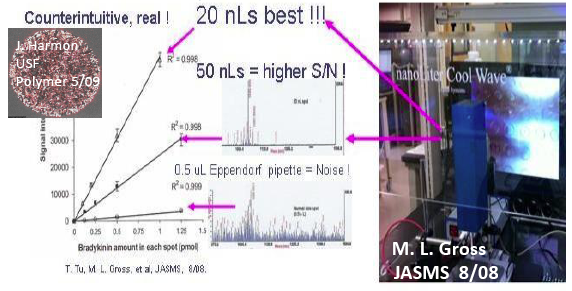 The nL Cool Wave can MS measure Lanthanides(Actinides) chelates at fg levels in the field WITHOUT a plasma, AC, nanoLiter LLC sells devices, collaborates and LICENSES IBF LCMS, syringe, pipette and gaussian surface patents. We can also develop IP for YOUR “IBF-ed” products, optionally assigning rights. 100% ESI UPLC MS & MALDI tool. Android controlled, same device. IBF yields major sensitivity increase for ESI, MALDI SIMS & LDI, too. nLs make DOD tasks more accurate, safer for Army, AF, NIH, NIST & NASA! Example customers, clients: U's of Ill, WI, CA, Cinn., MUSC, Wash. U., USF, USU, US Army APG, ECBC and Natick, Air Force, Abbott, Biogen Idec, Genentech, Amgen, Hitachi, Allergan, Sciex, Spark, Douglas, NIH, NIST, USDOE INL, Ga Tech, UNH, Duquesne, more.